Another one hosted over at J. Kaye's Book Blog! I've never read anything in this genre so am intrigued. 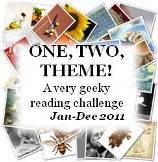 The challenge runs from 1 January to 31 December 2009 and requires us to read 10 erotica during that time. Check out the challenge post for the rules and to sign-up. Welcome to the Erotica Romance Challenge! If you ever get an opportunity to read one from the UK, it's truly an eye opener...lol! This sounds like a saucy challenge. I have never read any erotica. I'm not sure I want to..